The Subaru Sambar was introduced in 1961 as Japan’s first Keitora (軽トラ) or kei class truck. This fifth generation Sambar is a long way from the original 2-cylinder powered version, but it still puts the motor behind the rear wheels and offers a surprising amount of versatility for its overall dimensions while conforming with the Japanese kei-car (keijidōsha or light automobile) regulations. 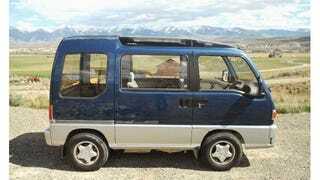 Find this 1991 Subaru Sambar offered for $4,500 in Salmon, ID via craigslist. Tip from AbnMike. How much more Idaho can you get than a small town named Salmon with a population of 3,112? Perhaps a town named Potato or Spud could be even more descriptive of the 14th largest and 39th most populous state in the Union, but today’s feature has floated a long way from home. The Sambar is powered by a 660 cc EN07 inline-4 cylinder gasoline engine located in the rear that puts out 54 horsepower into the rear wheels with the help of an intercooled supercharger. Add four wheel drive and a 6-speed manual gearbox hardly makes this thing a GTR competitor, but it’ll certainly be as much fun as anything else you can find for less than $5k. Image from NinjaGarage, who has a sweet vintage Sambar brochure here.